The RCN is a trades union with a fancy, particularly loyalist name. It is extremely partisan, as it should be, in pursuing the interest of its members, not a ‘body’ charged with the responsibility to use scientifically gathered evidence to support any claims of need for change or of a crisis in resourcing. The Nuffield Trust is a body. So is NHS Scotland or, for teachers, the GTC. The Scottish Government’s departments are ‘bodies’ of that kind. 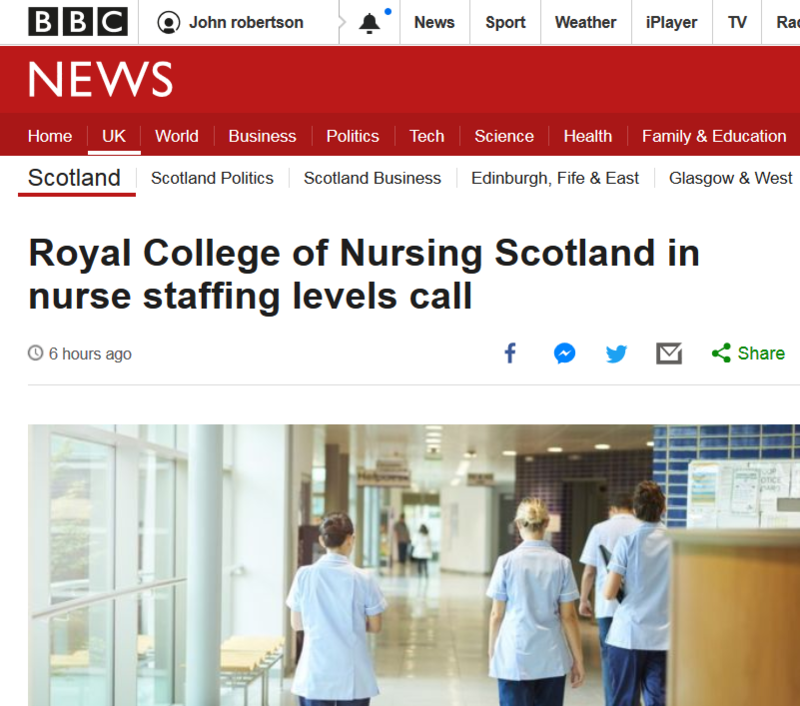 So, when the Scottish Government mention an actual increase in the overall number of nurses, regardless of vacancies at this low level, a responsible news agency should give that some prominence. Missing from BBC Scotland reporting, as usual, is any kind of context which might help the audience put the figures in context. Third, how does the NHS Scotland staffing ratio compare with other NHS areas? How many nurses are there in Scotland? Well, as you see above, there were 59 455 nurses and midwives in Scotland. Now if NHS Scotland is very tightly stretched in terms of nurse staffing, as the RCN suggest, even a small number of vacancies would matter. Let’s have a look at UK staffing levels (can’t seem to find reliable England-only figures) as a comparison to see how they compare. The UK has a population of 66 643 010 and 690 773 nurses and midwives and so the ratio is one nurse to 96.4 people. Scotland has a population of 5 254 800 and 59 455 nurses and midwives and so the ratio is one nurse to 88.4 people. While not denying the possibility of over-stretch, in some areas, this suggests that if it is, in NHS Scotland, then NHS England is in an even worse situation. Using the Latin ‘sic’ to indicate that an error of spelling, grammar, or logic has been quoted, in a medical context, appeals to my sense of humour (sick?). Dumfries and Galloway is rapidly becoming a region of the retired. The latest demographic analysis predicts more than 48,000 over 65s enjoying life in the region in 21 years time. And not far off ten per cent of them will have seen their 90th birthdays. At the other end of the scale the number of 15 to 64 year olds is set to drop by almost 20 per cent to somewhere in the region of 74,000 as the overall population of the region shrinks to around 143,000. The figures are included in a plan drawn up by health and social care bosses wrestling with the make up of the workforce needed to cope with the ageing situation in the coming years. HOLYROOD should have control over immigration, have £15 billion more in borrowing powers and could get more tax powers as part of a plan to create a new economic settlement for post-Brexit Britain. These are among the recommendations of the IPPR’s Commission on Economic Justice, whose members include Justin Welby, the Archbishop of Canterbury, and leading UK figures from business, trade unions and civil society, and which insists the economy is not working and needs “fundamental reform”. You see if you call it a body , it makes it sounds like there is no official agenda there , just telling it as it is . If you say it is a Union , people know you are acting out of self interest in the hope of getting something out of it . Can’t have the public thinking midwives and nurses would be acting out of self interest after just getting a 9% pay rise now can we . How conscious a decision did the reporter make in choosing that word? Pretty calculated I would say . THE SNP’s Gordon Macdonald has written to the UK government calling for reassessments of Child Tax Credits in Scotland to correspond with Scottish school term times, following reports of delayed payments. The Edinburgh Pentlands MSP has been contacted by families who are struggling to manage, after they did not receive the Child Tax Credits payments they were due. HMRC confirmed they are recalculating all Child Tax Credits in line with the return of schools in England, with payments delayed due to system overloads. Brings to mind one of Keir Hardie’s more restrained descriptions of Westminster “..putrid mass of corruption, a quagmire of sordid madness, a conglomeration of mercenary spiritless hacks dead alike to honour and self-respect”. One wonders why old KH didn’t just let them have it from both barrels. It’s carrying on with Reporting Scotland this evening. Sad nurse pictured saying how they are all struggling and under stress through exhaustion because of nurse vacancies. No contact at all given. However did admit lifeguards in traing but to ‘balance’ thst, sauntered are also vacancies for physio and occupational therapists. Sorry, predictive text produces garbage while you post! Meant to say no context then nurses in training. The professional body for Nurses is the NCM. Nursing and Midwifery Council. As you rightly say the RCN is a Union which most nurses don’t join. Mr Robertson, You are going to have to keep plugging this rapid rebuttal every time they quote the doctors union, the teachers union, etc as ‘bodies’ or other euphemisms. There is a class element in the way these ‘bodies’ are presented as sincere ‘professionals’ whereas a ‘body like the Confederation of Health Service Employees was usually quoted in a critical way because of the general hostility to the trade unions which do not represent ‘professionals’. The other common presentational device is that private schools are always prefaced by ‘TOP’ or ‘LEADING’, whereas if there is a report on, for example, Lenzie Academy or Gryffe High School they might, just might, identify them as ‘top performing STATE school’, with the emphasis on ‘STATE’, but somewhere, they would slip in an unfavourable comparison with the number of Highers attained by students of say, The Edinburgh Academy, because Lenzie and Gryffe, for example, while they serve predominantly affluent areas, have wider catchment areas and non-selected intakes.